After a series of flight trials, the Indian Air Force has asked the Aeronautical Development Establishment (ADE) to make 50 laser-guided bombs (LGBs). 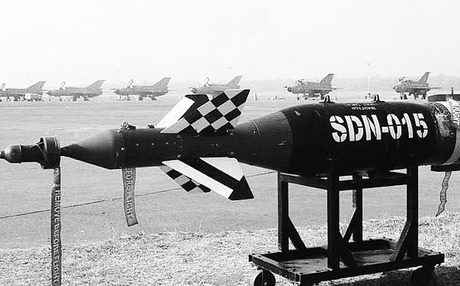 These bump bombs called Sudarshan, hitherto part of IAF’s vintage ammunition, are getting a life-extension with an improvised range and strike capabilities. The ADE won the project for developing an LGB seven years ago and successfully demonstrated the capabilities during trials in 2010. “Our mission was to develop an advanced laser guidance kit for 1000 lb class dumb bombs so as to improve the accuracy. We demonstrated the same and now the IAF has asked us to make 50 Sudarshans,” ADE director P S Krishnan told Express on Tuesday. Krishnan said the laser-guidance seeker, fitted on the nose of the LGB, is the most critical desi component on board. “It’s developed jointly by IIT Delhi and ADE, while BEL is the production agency. The guidance kit directs the bomb towards a target, which has been illuminated by laser energy using a laser designator system. The laser energy is reflected from the target and detected by the laser seeker unit on the LGB kit. The seeker provides information on the deviation of the laser sport from the centre line of the detector,” he explained the features of the bomb. Sudarshan has on board a flight control computer with microelectromechanical systems-based rate gyros. It also has high-precision linear ball-lead-screw actuators. A next-generation bomb (NG-LGB) is in the pipeline, but the scientists need to address the problem of rolling of the bomb, after its release. “The range of Sudrashan now is around 9 km if dropped from a normal altitude, and for the NG-LGB we hope to increase the range to 50 km,” he said.